Reportedly, Oppo has launched F series smartphones as the international version of Oppo R series, but now the time has changed. In current scenario, both of the Oppo series are being marketed. But, it seems now that the company will revert back to its old system, the Oppo R19 poster reveals this. Yesterday, a new upcoming smartphone from Oppo called F11 leaked and Oppo R19 poster seems much similar to it as well. This R19 is to be launched in China, however the F11 Pro is reaching in India in the initial March days. According to Oppo R19 poster, the smartphone seems to have shaved off bezels with a thin cutout in the top frame for its speaker. Since the phone seems missing notch or punch hole, it simply indicates the phone equips a pop up selfie snapper, much similar to Vivo V15 Pro. According to leaked pictures last week, it already revealed Oppo R19 camera slide out feature from the middle rear section. Talking about rear design of Oppo R19, it sports a dual rear cameras with LED flash placed above the sensors. All three things, 2 sensors and LED flash are arranged vertically and residing in same house. Also, they are positioned in the middle rear of device and connects to the frame. The post just additionally tells about Oppo R19 48MP dual camera setup as well, under which the primary sensor will be off prescribed megapixels, however the other one will be for depth enabled photography. Looking through the poster of Oppo R19, it appears no fingerprint sensor on the back of phone, also there’s no fingerprint icon on display, but it’s expected the device will have in-display fingerprint scanner. Talking more about the design, the device has a blue-purple gradient finish, however it should be marketed in other color variants as well. 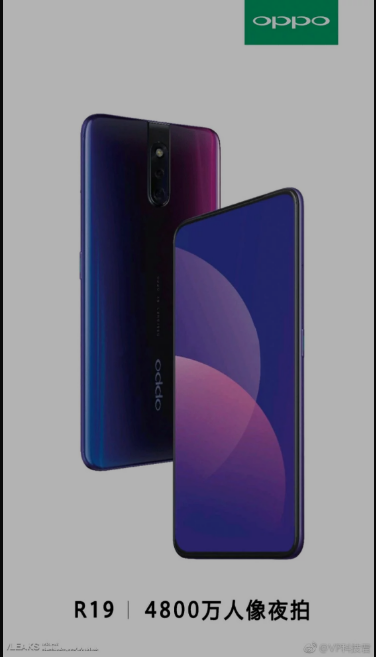 Currently, there’s no actual information about when Oppo will officially announced this phone, however it’s expected the device will be unveiled in China before Oppo F11 Pro is launched in India. For more technical news and articles, Subscribe Us now.